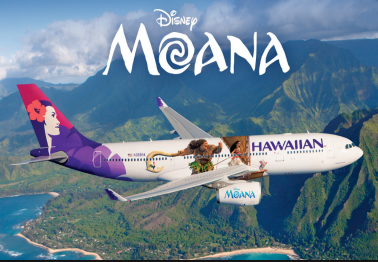 Hawaiian Airlines Wayfinder Caption Contest – Win a trip to Los Angeles for the premiere of Moana! Win a trip to the premiere of Moana in Los Angeles! ENTRY LIMIT – Limit: Each entrant may upload one (1) Submission per illustration during the Contest Period and may receive up to three (3) entries per person or email address. country of legal residence whichever is older) at the time of entry. SWEEPSTAKES ENTRY PERIOD – The Contest begins on 15 October 2016 at 12:00 a.m. United States Hawaiian Time (“HT”) and ends on 23 October 2016 at 11:59 p.m. HT. PRIZES – ONE (1) GRAND PRIZE: A trip for winner and a companion to Los Angeles, CA for the movie premier of Disney’s “Moana”. Trip package includes round trip, coach-class air transportation for two (2) from a major airport near winner’s home (determined by Sponsor in its sole discretion but including transfers within New Zealand to the nearest international airport) to Los Angeles, CA; three (3) nights’ accommodations at a hotel determined by Sponsor in its sole discretion (single room, double occupancy); two (2) tickets to attend the movie premiere of Disney’s “Moana” in November of 2016; and ground transportation to and from destination airport and hotel and to and from hotel and movie premiere. Winner must travel on November 12-15, 2016 or trip prize will be forfeited and a substitute prize of 140,000 HawaiianMiles will be offered. Travel must be round trip. Approximate Retail Value (“ARV”) of Grand Prize trip: $2,600-$4,000 USD. ONE (1) FIRST PRIZE: 80,000 Hawaiian Airlines HawaiianMiles. ARV: $2,368 USD. ONE (1) SECOND PRIZE: One (1) gift pack of Hawaiian Airlines Moana licensed hat, towel, plush dolls and backpack. ARV: $200 USD. Vistiana Pick Your Hawaiian Paradise Sweepstakes – Win a trip to Maui or Kauai! 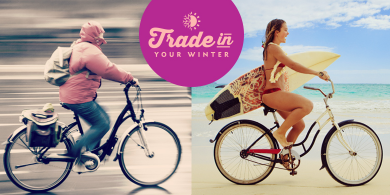 Win a trip to Maui or Kauai! ENTRY LIMIT – One entry per entrant can be earned each day during the Sweepstakes Period. ELIGIBILITY – You must be a legal resident of the fifty (50) United States (including the District of Columbia), Canada (excluding the Province of Québec) or Puerto Rico, and be 21 years of age or older as of July 7, 2016 to enter. SWEEPSTAKES ENTRY PERIOD – Sweepstakes begins at 12:01 p.m. EST on July 7, 2016 and ends at 11:59 p.m. EST on September 30, 2016. A Vacation Certificate on behalf of Sponsor. Vacation Certificate is redeemable for seven (7) nights and eight (8) days at The Westin Kā‘anapali Ocean Resort Villas or The Westin Princeville Ocean Resort Villas in a one (1) one-bedroom accommodation that sleeps up to 4 people. Prizewinners are not guaranteed a particular resort location, unit type or view. Fulfillment of your request is based on availability. Resort certificate must be consumed by December 15, 2017. Approximate retail value: $1750. Choice of one (1) Sunshine Helicopter Hana/Haleakala Tour on Maui for two (2) people departing from Kahului Heliport for Whisper Star Open Seating or one (1) Sunshine Helicopter Princeville Adventure Tour on Kauai for two (2) people departing from Princeville Airport for Whisper Star Open Seating. Helicopter Tours must be consumed by December 15, 2017. Approximate retail value: $600. 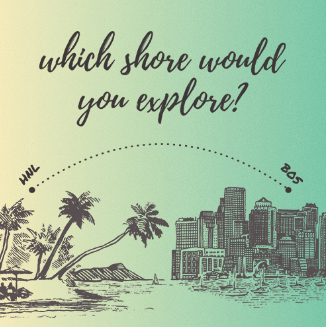 Two (2) round trip, first class tickets on Hawaiian Airlines from any of their U.S. gateway cities. Tickets will be acquired through the redemption of up to 175,000 Hawaiian Miles by the Sponsor. Some restrictions apply. Hawaiian Airlines tickets must be consumed by December 15, 2017. Approximate retail value: $2,450. 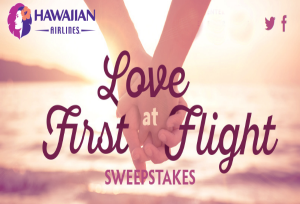 Hawaiian Airlines Love at First Flight Sweepstakes – Win 140,000 HawaiianMiles & more! 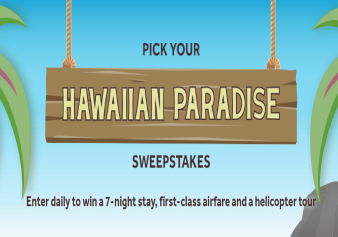 Win 140,000 Hawaiian Airlines HawaiianMiles & more! legal residents of the fifty (50) United States and the District of Columbia who are at least eighteen (18) years old at the time of entry. SWEEPSTAKES ENTRY PERIOD – The Sweepstakes begins on February 1, 2016 at 12:00 a.m. Hawaiian Standard Time (“HST”) and ends on February 29, 2016, at 11:59 p.m. HST. (http://www.hawaiianairlines.com/HawaiianMiles/Pages/terms-and-conditions.aspx. ); five (5) nights’ accommodations at The Royal Hawaiian, a Luxury Collection Resort (single room, double occupancy, fulfilled as an eCertificate (terms and conditions apply). Hotel eCertificate expires on February 29, 2017; and a dining certificate, valued up to $250, valid for a one (1) time use at Azure Restaurant, Honolulu, HI(terms and conditions apply). Dining certificate expires one (1) year from certificate date. Approximate Retail Value: $7,275.